Counted in vine-years, Scheurebe is a baby - just over a hundred years old... exactly 102 years that is. 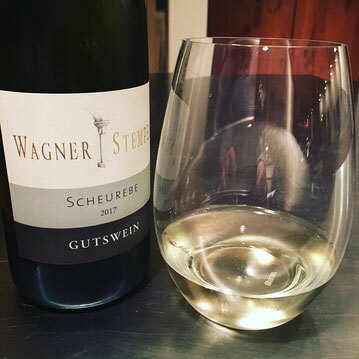 Scheurebe is the result of German viticulturalist Dr. Georg Scheu's work, successfully crossing Riesling and Bukettraube (literally bouquet grape, a lesser known aromatic varietal) in 1916. Scheurebe can have pronounced and layered characteristics, from intense, tropical lychee, grapefruit and passion fruit to black currant bush and mint, lime sorbet and feline essence or boxwood. In some ways it can remind the discerning wine lovers of a Sauvignon Blanc. Scheurebe is well established in Rheinhessen, but one will find it in Pfalz, Nahe and Franken, too. Initially created with mostly practical characteristics in mind, such as larger yields and frost resistance, the more modern expressions and beautiful of Scheurebe are owed to a bunch of younger winemakers who wanted to celebrate the vine's 100 anniversary in style. The grape’s fresh-fruit characteristics, rather medium acidity and medium-to-light body make it a nice alternative to Sauvignon Blanc - pair it with light goat cheeses or serve it as a companion to summerly vegetable dishes. In Rheinhessen we love the wines that Eva Vollmer and Wagner-Stempel create from their Scheurebe vineyards. Uncomplicated, quaffable, good-mood wines.